For those without comedic tastes, the so-called experts at Wikipedia have an article about Trombone Hero. Trombone Hero is a video game that faithfully recreates the pressure and savage intensity of being a touring trombone player. The game was created by the developer "Always Hard" after the success of their first game, Tambourine Virtuoso, which sold over 9,000 copies in the first hour of release. 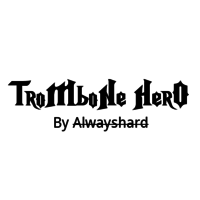 Trombone Hero was first conceived when Tambourine Virtuoso developer, Stump Merriweather, went to the House of Blues to see Burning Horn Jonson play his trombone of death set, which resulted in 14 Cardiac Arrests in the front row, Explosive Diahorea in the 3 rows behind them and the barman miscarried even though he was a man. Stump was so impressed that as soon a he left hospital with a new bowel he immediately started to develop Trombone Hero, sadly, There were lots of accidents in the production of the game, 14 Fatalities, 16 "lost" staff members, all beta testers spontaniously combusted. On the 6th of January 2013, It was released for the Polystation 3, the Chintendo Vii and the Sega Genocide. The trombone peripheral was moulded from a design by Hans Snickers, who exiled himself away for months, living only on thumb tacks and rain water. He was found dead by Jehovah's Witnesses, naked and covered in soup, clutching the Trombone Prototype. Rumours circulated the Always Hard offices that the mouthpiece was made from Asbestos, and the reed was made of Crystallised Tears. However, a science study has proved it was NOT Asbestos, It was really lead and Crystal Meth. The player starts as a unknown trombonist who must raise funds for his addiction to soup. Starting at small venues and working up to the trombone world championships. The trombonist also had a side mission mode where you roam the streets of New York, Jacking cars, and killing anyone who has a guitar in public. He also burns all Guitar Hero DVDs, this resulted in a Lawsuit from Neversoft, and was removed from the final game. When Crystallised Meth was found inside the Trombone that was Pre-Packaged with the game, this caused serious addiction. The Developer, Always Hard, stated that Meth was a essential component of the Peripheral and the cheapest material to make it out of. The lead had caused 1000 Chinese Workers to die after contracting a severe addiction to Meth. The game was rated by IGN as the greatest game of all time, Receiving 11/10 and was surrounded by lots of Hype. When Trombone Hero was released, it gathered lots of praise from the public. Since some idiots blamed the Illuminati, saying that the game influenced brain control, the forum of over 50000 daily community members was took down by some Script Kiddies using Low Orbit Ion Cannon. Anonymous declared war on Trombone Hero, but the CIA loved Trombone Hero so much, they actually put some effort into hunting the hackers and arrested their ringleaders. The remaining hackers committed suicide after hearing the CIA would put them under "enhanced Interrogation Techniques". This page was last edited on 24 July 2015, at 08:11.